Ornate details bring international whimsy to a basic kitchen. Photography by Simonne Bolla of Bolla Photography. 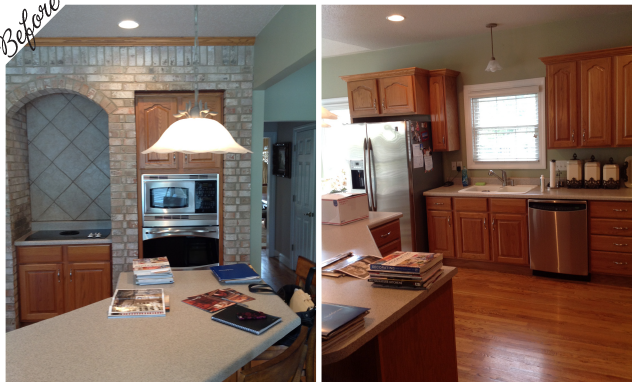 After finding the perfect place to call home, Nick and Olga Mandis quickly realized that their nonfunctional kitchen would need to undergo a floor-to-ceiling renovation to echo the welcoming warmth and historic beauty of their Mediterranean heritage. The cozy 195-square-foot entertaining space now brings the growing family together and boasts exquisite detail inspired by the couple’s Greek roots. With a clear vision in mind, the homeowners teamed up with designers Tricia Billhartz and Heather Ragan of Herzog Kitchen & Bath to bring their dream kitchen to life. “I had a specific image in my head of what I wanted, and they made that image a beautiful reality,” says Olga. Included in that picture-perfect plan were all-new appliances, a spacious farm sink and stunning glass-door wall cabinets to sit on both sides of the gas-range stovetop. An oversized mantel hood and two-level island, both key features of the redesign, were particularly challenging to incorporate into the quaint kitchen, but once installed became chic, eye-catching focal points. By widening and reshaping the existing island, the area instantly became more open and room for much-needed seating and workspace was created. Leaving little untouched, the designers used innovative solutions and a make-it-work attitude to craft the sophisticated kitchen that the homeowners desired. 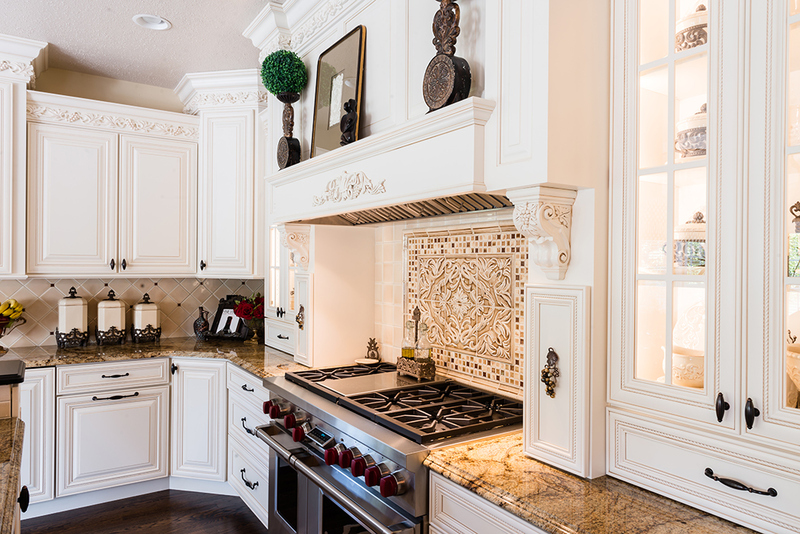 Intricate details, like decorative grapes and other elaborate flourishes, were tastefully added throughout the kitchen to infuse the space with Grecian flair. “I wanted to integrate a wine motif that reminded me of the Tuscan countryside,” Olga explains. Delicate rope molding dances across the cream cabinetry and rustic, bronze handles adorn each solid-wood door. 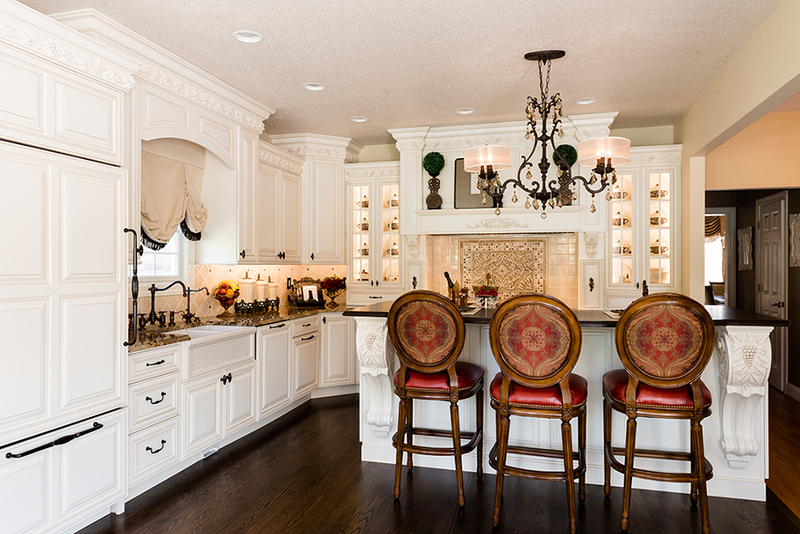 Two massive corbels make a sophisticated statement and add originality to the now fully functional island. Each of these polished pieces showcases a similar grape design to help create a uniform feel. The handcrafted, mosaic backsplash has a dual purpose in the family-friendly space, to keep the kitchen clean and provide the perfect finishing touch to the makeover. Pops of burgundy, an espresso finish on the hardwood floors and fashionable accessories complement the home’s inviting atmosphere. “In the plan it looks like a simple kitchen, but the detail and innovation that went into it were really what transformed the room," Tricia notes. Effortlessly meshing Old-World elegance with contemporary luxury, Nick and Olga’s dream kitchen serves up a hearty helping of Greek charm that helps make their house feel more like home.